This article is dedicated to my mother-in-law, Lucille Palmer. She must have been a good cook, for after 41 years of marriage I’m still hearing about it. My husband's past is tied to food. I often said that a trip to visit my in-laws was like being diabetic (I should know, I am one). A diabetic's life is not an easy one. Meals are tied to time and content. Once a meal is out of the way you are planning for the next. I find a diabetic spends an inordinate amount of time thinking about food. All of the above applies to my husband's family. Diabetics usually think about food we can't eat. Here endeth the similarity, for they ate everything and lots of it. My husband's family spent more time planning, timing and thinking about food than any group of people I've ever known. Once breakfast was finished and the dishes cleared, my father-in-law would be asking what was for lunch and dinner. It was, my husband explains, due to the fact they were farming people. Food was energy. Timed to get you out in the fields where you would burn up that energy, then back in for the next meal, and so on. Every meal was rewarded with dessert. My husband has always spoken longingly of his mother's cooking, so when his father died and we cleaned out the family home he was so excited to happen on an envelope of her handwritten recipes. Heavily weighted toward dessert, I might add. In going through the little handwritten cards I found three ingredients used over and over again. Sour cream, raisins, and rhubarb. There was sour cream raisin cake, pie, and cookies. Sour cream rhubarb cake, pie, and cookies. The sour cream raisin pie was the most exciting find for my husband. Sour cream raisin pie is his favorite. 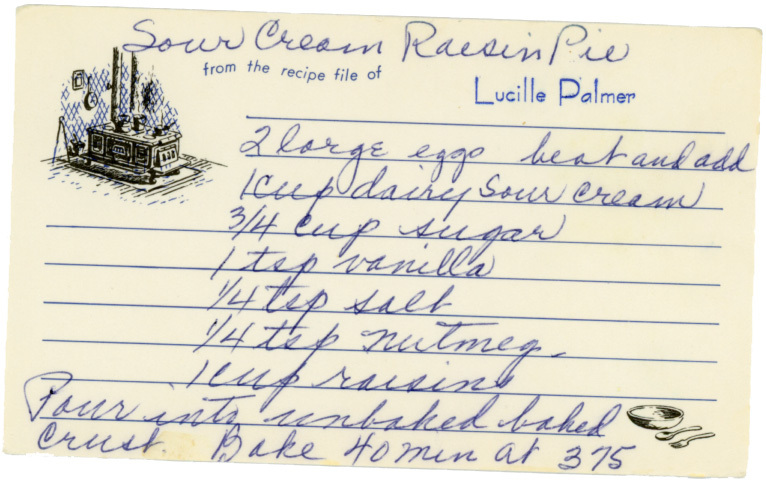 Reading through the recipes was a miniature history lesson featuring 1950's decorated cards, cards attributing the authorship to her children, relatives, neighbors, and an occasional cut-out from one of the farming magazines. Ingredients of the time and of her garden. Ingredients such as Karo syrup, Crisco, and the irrepressible Jell-O. And from the garden zucchini, rhubarb, corn, and plums. Food memories for my husband. 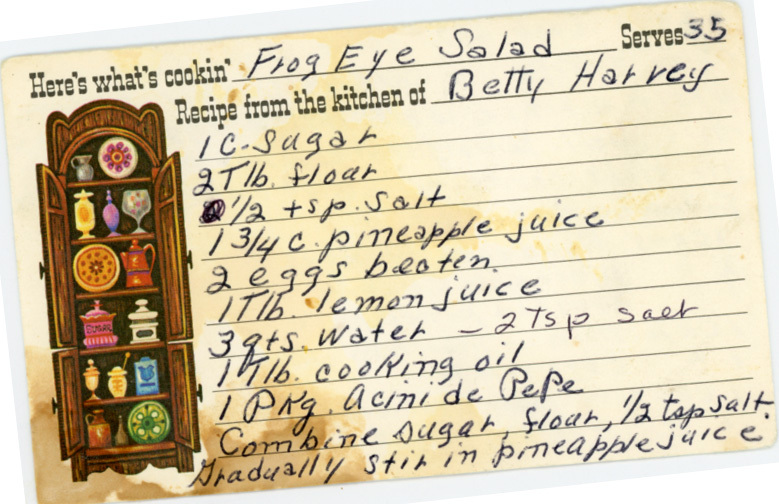 There were recipes titled Linda Bundt's Bundt Cake, Betty Harvey's Frog Eye Salad (Serves 35), and Kathy's Ribbon Ice Box Dessert. Many of the cards are punctuated with Lucille's comments - Very Good, the Real McCoy, problem! And tucked away in the middle of thousands of cards I found a surprise. A recipe in my own handwriting. A dish I had made for Lucille over forty years ago. Saved. To understand my surprise, you'd have to know I was a second wife, a difficult position to play in any game. After thirty years, she warmed to me. So, even if she never made my recipe. She saved it. And that means a great deal to me, even after all these years. 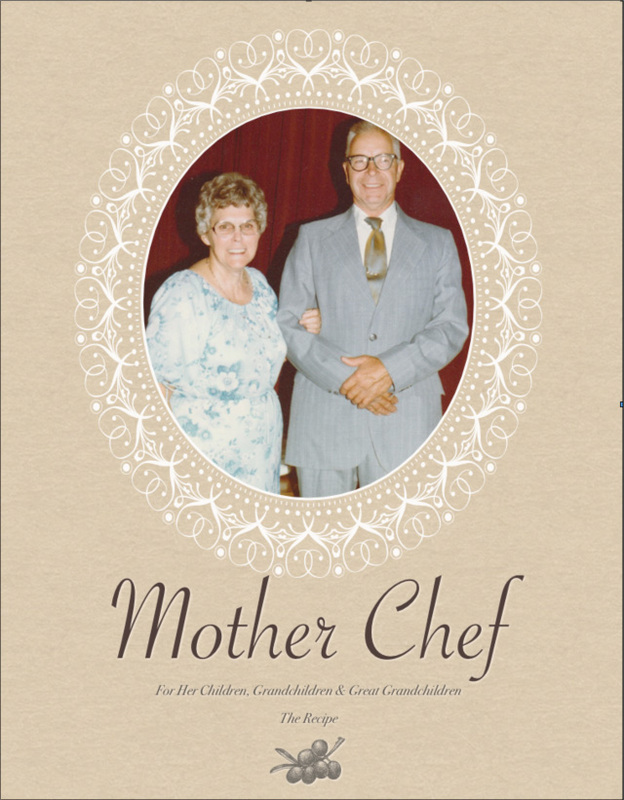 In her honor, I am scanning the cards and transcribing the recipes into a book for her children, grandchildren, and great grandchildren. It will tell of her life and be punctuated with photographs. I think it would have pleased her. There must have been something about the way they taught handwriting in the old days - your mother-in-law's handwriting very much resembles that of my mother on her handwritten recipes. One of the best time capsules we have are the old recipe boxes! Greta - just read an article about the fact that handwriting is no longer being taught in the schools. Printing yes, handwriting - no. If you look back at the old practice manuals you'll see why the handwriting was so similar. I loved going through the recipes. It is family history! What an awesome post!! It so reminded of my grandmother who we called Mamaw. I remember well her desserts! At the time of my Moms heart attack last July we found out she was diabetic, so eating habits have changed drastically. I LOVE your idea of the book of recipes and pictures!! What a wonderful tribute! So much delicousness in one post...and I am so glad your mother-in-law had a recipe card from you! Thank you! I find it really difficult to think about food all the time. It takes the joy out of a good meal. Jo: Thank you for commenting. Always glad to help jump start a great family project. Dorene: Leave it to you to recognize the part of this post that meant the most to me. Thank you! Such an evocative post. Those of us who've cleaned out the houses of our loved mothers, aunts and grandmothers can relate. My cousin actually framed a couple of her mother's recipes to hang in her kitchen. 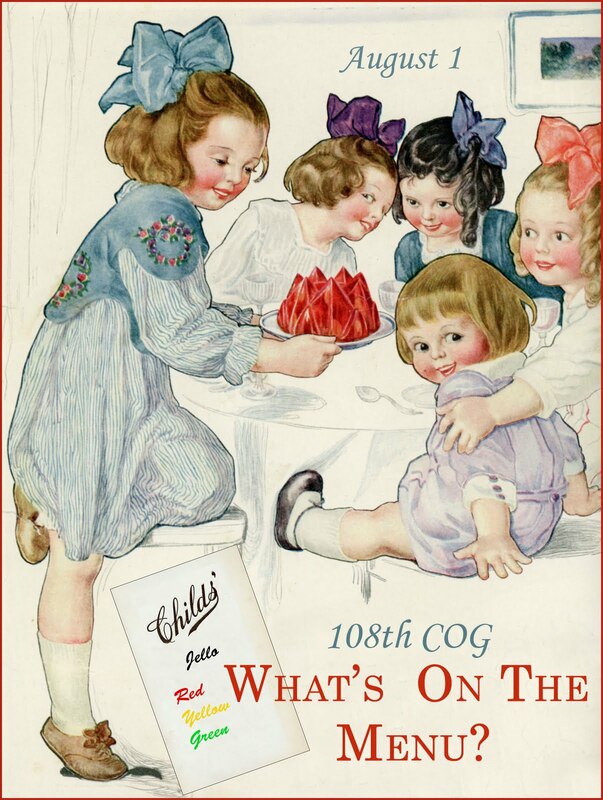 And how did I miss the Jello in your poster? I don't know if it's better to think about food early or late. My mother often waited till about an hour before dinner needed to be on the table to start thinking about what to fix. Some days I follow her approach, other days the approach of your in-laws. I love the old recipes cards. I inherited my mom's and grandmother's recipe boxes but neither had such fun cards in theirs. 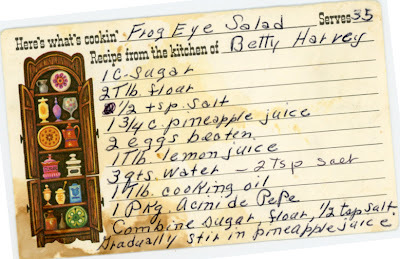 It must have felt like a compliment from the grave to find your recipe in your m-i-l's box. I LOVE the framing idea! I'm framing some old Cream of Wheat posters for my kitchen, but I must add this idea. Thanks, Susan. When my family saw the poster they all laughed. I can not look Jell-O in the face. I spent a year in a hospital once and was served yellow Jell-O more times than I care to remember. Nancy - It was written proof that she really had warmed to me. And thank heaven being diabetic doesn't eliminate popcorn. LOL!That would have been a real tragedy. 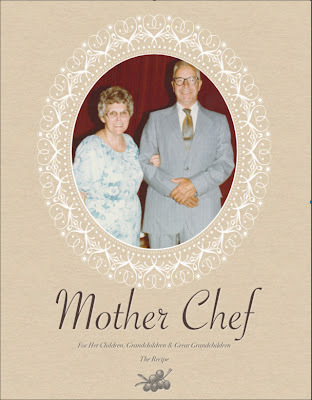 What a wonderful post and to have the recipe cards, a lovely addition to your family history. fM-As a fellow diabetic I know what you mean about thinking about food. I'm glad she saved that recipe of yours! I love recipe cards, I just wish I had more of them in my family past. For my bridal shower my friends gave me a recipe shower, where everyone brought a recipe written on a card, plus a dish or utensil you used in making the dish. I guess they knew I liked food :) My mother wasn't so much the sort to write her recipes down but I do have a couple she mailed to me when we lived in different states, and now that she's gone they're real keepsakes.